The Government Accountability Office said the FS failed to provide a reasonable justification for limiting the maximum size of the retardant tank. Above: The 747 SuperTanker drops on the Palmer Fire south of Calimesa and Yucaipa in southern California, September 2, 2017. Photo by Cy Phenice, used with permission. The Government Accountability Office has upheld a protest by Global SuperTanker (GST) who contended the Forest Service’s (FS) contract restriction on the maximum size of a retardant tank was unduly restrictive of competition. The FS issued a solicitation for Call When Needed air tanker services May 16, 2017. For the first time in their air tanker contracting history, according to the GAO, the FS restricted the maximum size of retardant tanks, specifying the capacity must be between 3,000 and 5,000 gallons. This eliminated Very Large Air Tankers (VLAT) from being able to compete, since the DC-10 holds 11,600 gallons and the GST 747 carries up to 19,200. 10 Tanker Air Carrier, which operates three DC-10’s, attempted to support GST’s protest, but the GAO denied their request to submit an amicus curiae or friend of the court pleading, concluding that the company did not meet the definition of either a protester or an intervenor under the GAO’s Bid Protest Regulations. …failed to provide reasonable justifications for the challenged specification, such that we are unable to conclude that the challenged specification is reasonably necessary for the agency to meet its needs. We recommend that the agency make a documented determination of its needs. Once the agency identifies its needs, the agency should revise its solicitation to include specifications that are reasonably necessary to meet those needs. We also recommend that the protester be reimbursed the costs of filing and pursuing the protest, including reasonable attorneys’ fees. 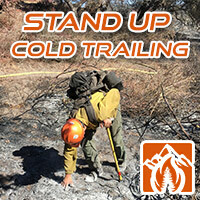 In accordance with regulations, the U.S. Forest Service is complying with the U.S. Government Accountability Office (GAO) decision for the Call When Needed (CWN) protest. We are reviewing our documentation. After the review is completed, the agency will determine the most appropriate ways to continue to procure Large and Very Large Next Generation Airtankers. We are pleased that the GAO sustained our case. We really look forward to working with the Forest Service in the future and hopefully these issues around the [Requests for Proposals] will work themselves out to everybody’s satisfaction. In 2016 and 2017 the 747 deployed to fires in Israel and Chile and the company currently has a CWN contract with the California Department of Forestry and Fire Suppression. 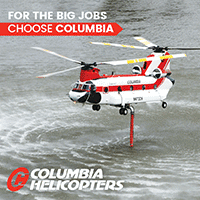 The aircraft was used for several weeks in California in the last part of the summer supporting CAL FIRE, but the FS has not allowed the company to submit a bid to acquire a contract. 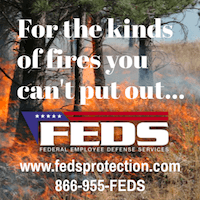 In the 22-page decision, the GAO addressed numerous issues introduced by the FS that attempted to justify the agency’s new policy of restricting the maximum size of a retardant tank in a contract solicitation. In each case the GAO argued that the FS was wrong, unreasonable, illogical, or, it did not apply to the issue. The 747 Supertanker drops on the Railbelt Complex of Fires in Alaska July 31, 2009. At that time the aircraft was operated by Evergreen Aviation. Photo by Mike McMillan, Fairbanks Area Forestry. The FS claimed that the solicitation was intended to procure services to support initial attack operations for which VLATs are not suitable. The GAO responded that the solicitation sought to procure aerial firefighting services to support both initial and extended attack operations. And, since it was a CWN contract, the FS could choose whether or not to use the VLAT on initial or extended attack. …there is also no support for the agency’s contention that VLATs are not suited for performing initial attack operations. The GAO noted that 10 Tanker Air Carrier’s DC-10s had completed a total of 700 missions in 2017 at the time of the decision and routinely performs initial attack operations. Indeed, the record is completely silent regarding who, if anyone, at the agency made the decision to include the [maximum tank size] restriction, when the decision was made, and why the decision was made. Notably, none of the pre-solicitation documents contain any reference to a 5,000-gallon maximum restriction. The FS cited air tanker studies from 1995, 1996, and 2005 as a basis for its restriction, but it did not identify any language in the studies to support the restriction. The cited pages do not lend support to the agency’s position. As an example, the page in the 2005 study merely indicates that the agency prefers larger aircraft over smaller aircraft, not that VLATs are somehow less desirable for initial attack operations. 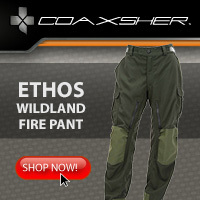 The  study recommends that the wildland firefighting aircraft fleet be composed of a mix of aircraft, including “Very Large Airtankers (>8000 gallons).” In discussing tank sizes, the study recommends a minimum capacity, not a maximum capacity, and reflects a preference for larger retardant tank capacities. The Forest Service has not identified any study or analysis, upon which it relied to develop the RFP requirements, that has considered the question presented here: whether VLATs are unsuited for initial attack operations. In sum, the studies relied upon by the agency do not provide a reasonable basis to restrict competition. Although the agency has reached conclusions regarding the technical limitations of VLATs, and is excluding VLATs from competition based upon such conclusions, the record does not demonstrate that the offered studies support the agency’s conclusions. For this reason, we are unable to find that the agency’s asserted justification for the exclusion of VLATs is reasonable. The FS pointed out that on two occasions a VLAT struck objects on the ground while taxiing. The GAO said both incidents occurred while FS ground personnel were directing the aircraft. Reviews determined that one was 100 percent the fault of the ground guides and the other was 75 percent the fault of the ground guides. The FS also listed several other reasons that they contend are significant problems related to the use of VLATs, including, the number of personnel needed on the ground, the amount of fuel and retardant needed, the number of suitable bases, and the need for lead planes. In their written decision the GAO addressed these and other issues brought up by the FS, and similar to the examples above, shot them all down, saying the FS was simply wrong or the issue was not applicable to the protest. The GAO noted that economies of scale, with the VLATs carrying four to seven times more retardant than a conventional large air tanker, can mitigate some of these issues. 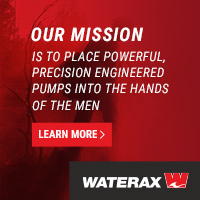 It seems to me that their main contracting focus should be the gallons of retardant required to be delivered per hour or per day and the total cost per gallon delivered and the ability to meet various delivery rates/ coverage levels. Platform type shouldn’t have any bearing on the issue at all unless there is some performance limitation that impacts its ability to meet delivery requirements. If they ever get around to defining what constitutes acceptable IA in terms of how much retardant, how far away from base, and how fast, then there may be some platform considerations. It appears from the GAO report that their decision to sustain the protest was not even close to going the other way. The FS seemed to be grasping at straws trying a shotgun approach, throwing out everything they could think of off the top of their head, with little serious thought, in their ill-considered attempt to prevent GST from being allowed to submit a bid on the contract. They came off looking like an inept, bumbling, incompetent, leaderless organization. This should be an embarrassment for Jeffery Power, the new Assistant Director of Aviation for the FS, and Shawna Legarza, the National Fire Director for the FS. Fire aviation is very expensive and based on the fatality records, is very dangerous. The Forest Service should consider reorganizing their aviation assets, removing the aviation autonomy from the individual regions and using a more centralized approach led by a Chief Pilot with actual pilot credentials and experience. It is our understanding that only one of the Regional Aviation Officers, who have far too much responsibility and power, is actually a pilot. For anyone who closely follows FS aviation contracting it is obvious that for the last five years it has been a quagmire, with bad strategic decisions being implemented poorly, resulting in numerous protests. (It must be contagious, because the condition spread to the BLM this year.) It took 555 days for the FS to award the first “Next Generation” air tanker contract in 2012. Perhaps a Chief Pilot and an improved contracting section would better serve their customers, including aviators and our citizens. 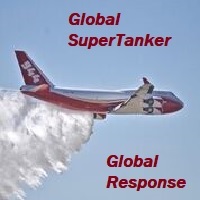 In the interests of disclosure, Global SuperTanker has an ad on this website. The U.S. Forest Service (FS) had hoped to have as many as seven additional “Next Generation” large air tankers working under contract on May 30, 2015, but protests filed by two companies could push that date back by several months. The FS first awarded contracts for Next-Gen air tankers in 2013 at the end of a 555-day process that also included protests which delayed the awards. Next-Gen air tankers are required to have capabilities not present in the previous generation of Korean War vintage machines. They must fly faster, be powered by turbine or jet engines, and have a capacity of at least 3,000 gallons of fire retardant. Two companies have filed protests about this latest round of potential contracts, Coulson Aviation and Erickson Aero Tanker. The protests were lodged with the U.S. Government Accountability Office which has the responsibility of deciding whether the protests have merit, which they are required to do by July 9 for Coulson’s protest and July 17 for Erickson’s. Both companies later amended their original complaints, which complicates the procedure for the GAO, so it is unlikely that anything will be decided much before those mid-July due dates. No contracts have been awarded yet, nor has the FS announced what their intentions are about the contracts. The two companies are protesting the terms of the solicitation which was first posted on February 19, 2015, and then amended five times. Responses from bidders were due on April 9, 2015. 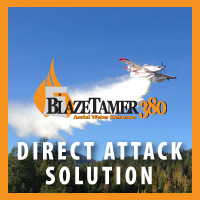 In researching this article we reached out to Erickson Aero Tanker and Coulson Aviation, but did not receive replies by our publication deadline. When the awards were announced for the first round of Next-Gen contracts in May, 2013, Neptune Aviation did not receive one of the seven contracts and filed a protest. A few weeks later Neptune dropped their protest which allowed the FS to finalize the contracts form the other seven air tankers. It was disclosed later that the FS and Neptune had entered into a written agreement under which the agency agreed to award Neptune a sole-source contract for two Next-Gen large airtankers in exchange for Neptune withdrawing its protest. In December, 2013 the FS awarded the promised sole source contract to Neptune for the two air tankers beginning in 2014. The estimated minimum value of the contract was $141,000,000 and had a base period of four years with the possibility of adding five more. If those five years were tacked on it would could have brought the value of the contract up to almost half a billion dollars. The basis for awarding the non-competitive sole source contract to Neptune, according to the FS, was that the company was in danger of going out of business. The agency used the industrial “mobilization exception” to the requirement to conduct a competitive procurement. Their rationale was that without Neptune, the FS could not field an adequate number of air tankers. In March, 2014 we wrote a very detailed article about the sole source award and how it developed. That sole source contract was protested by three companies, Coulson Aviation, 10 Tanker Air Carrier, and Minden Air Corp. The GAO upheld the protest, writing in their March 2014 decision that the sole-source award to Neptune in exchange for Neptune’s withdrawal of an earlier protest, was not a reasonable basis for the agency’s action. GAO also disputed the claim that Neptune was in danger of going under, and recommended that the FS reimburse Coulson, 10 Tanker, and Minden for their costs of filing and pursuing the protests, including reasonable attorneys’ fees. The General Accountability Office has released their 23-page decision documenting why the agency sustained the protest filed by three companies over the sole source air tanker contract that the U.S. Forest Service awarded to Neptune Aviation December 12, 2013. The non-competitive contract, worth $141 million to $496 million, specified that Neptune would supply two or more next-generation air tankers, BAe-146s, for the next four to nine years beginning in 2014. In our previous article about the decision we included the text of a press release issued by the GAO, but this 23-page document provides much more detail. Neptune’s Tanker 41, a BAe-146, at Missoula, August 11, 2012. Photo by Bill Gabbert. The Government Accountability Office announced today that they sustained the protest filed by three companies over the sole source air tanker contract that the U.S. Forest Service awarded to Neptune Aviation December 12, 2013. The non-competitive contract, worth about $141 million, specified that Neptune would supply two or more next-generation air tankers, BAe-146s, for the next four to nine years beginning in 2014. A spokesperson for the GAO said their review concluded that the U.S. Forest Service “could not reasonably justify” the non-competitive process used in awarding the contract to Neptune. The three companies that protested the sole source contract were Coulson Aviation (USA), Inc; 10 Tanker Air Carrier, LLC; and Minden Air Corp. If only the minimum two air tankers were signed up, the value of the contract would be about $141 million. If the options for five additional tankers were utilized, it would be hundreds of millions. The protest automatically halted the activation of the sole source contract when it was filed in December. The U.S. Forest Service is committed to ensuring that we have all of the resources we need to fight wildland fire and protect the lives and property of the American people. Airtankers are an important part of our efforts and we are currently reviewing the GAO recommendation. In the protest filed with the GAO, hundreds of pages were submitted, listing dozens of reasons why the three companies felt the sole source contract should be terminated. 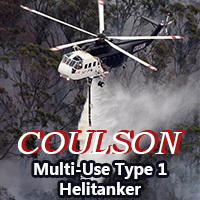 The Coulson company argued that on several occasions they told the USFS that they could supply more than the one C-130, but were told that the funding situation was too uncertain to commit more air tankers. Then a few months later, the USFS issued a contract potentially worth at least $141 million. 10 Tanker made similar offers, and in fact had a second DC-10 fully certified and on a call when needed contract that they would have liked to convert to an exclusive use next-gen contract. They also said they are working on retrofitting a third DC-10 which they expect to have ready to go by the end of calendar year 2014. This was the third USFS air tanker contract that has been officially protested in the last two years. Two of those were sustained by the GAO, the recent sole source contract and the original attempt to issue contracts for next-gen air tankers, while the third, filed by Neptune, was dropped five months before the company received the sole source award in December. Neptune will have six Korean War vintage P2Vs (2,082 gallons each) and one jet-powered BAe-146 (3,050 gallons) on exclusive use contract this year in what the U.S. Forest Service calls the “legacy” air tanker category. The company expects to have four additional BAe-146s ready to fight fire this year that are not currently on contract. 10 Tanker Air Carrier has one DC-10 Very Large Air Tanker on exclusive use contract and another on a call when needed contract. The company is in the process of retrofitting a third DC-10. They each carry 11,600 gallons of fire retardant. Coulson has one 3,500-gallon C-130Q on exclusive use contract and hopes to acquire and convert a second C-130. Minden has a contract for a BAe-146 but it has not yet been tested or approved by the Interagency AirTanker Board. The complete text of a statement by the GAO about the decision is below. It was written March 31 and released April 1, 2014. “The following is a statement from GAO regarding today’s decision resolving bid protests filed by Coulson Aviation (USA) Inc., 10 Tanker Air Carrier, LLC, and Minden Air Corp., B-409356.2 et al., March 31, 2014. 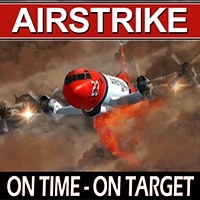 On March 31, the U.S. Government Accountability Office (GAO) sustained, or upheld, the protests filed by Coulson Aviation (USA) Inc., of Port Alberni, British Columbia, Canada, 10 Tanker Air Carrier, LLC, of Albuquerque, New Mexico, and Minden Air Corp., of Minden, Nevada, challenging the sole-source award of a contract by the Department of Agriculture (USDA), U.S. Forest Service, to Neptune Aviation Services, Inc., of Missoula, Montana, for airtanker services to support wildland firefighting. The contract contemplates Neptune providing at least two modern large airtankers for up to 9 years (the contract also contains options to add up to five additional aircraft in each year). The total estimated value, based on all possible aircraft over all years, is approximately $496 million. A Neptune BAe-146 drops on the Devore Fire, November 5, 2012. Photo by Rick McCLure. Today, March 11, the Government Accountability Office will hold a hearing at their office in Washington, DC to consider the protests filed by three air tanker companies over the propriety of the U.S. Forest Service’s (USFS) noncompetitive contract award to Neptune Aviation Services, Inc., for next-generation large airtankers. The hearing was scheduled to begin at 9 a.m. ET, but was a closed session, open only to GAO personnel, attorneys for the three companies that protested the contract, and two individuals from the Department of Agriculture who have been asked to be available to testify, Lisa Wilusz, a Senior Procurement Executive, and Gregory Parham, the Chief Acquisition Officer. Even the owners of the protesting companies are prohibited from attending, to prevent them from being exposed to their competitors’ trade secrets. Protesting the sole source award for two BAe-146 air tankers to Neptune, are Coulson Aviation (USA), Inc; 10 Tanker Air Carrier, LLC; and Minden Air Corp. If only the basic two air tankers are signed up, the value of the contract would be about $141 million. If the options for the five additional tankers are utilized, it would be hundreds of millions. The GAO is required to make their decision about the propriety of the sole source award by March 28. Fire Aviation has reviewed almost three dozen documents filed by the protesting companies as well as the USFS’ Motion to Dismiss the protests. The files contain letters of protests, supplementary protests, transcripts of Congressional hearings, “declarations” written by some of the principles, an NTSB report, and an article from FireAviation.com. While it remains to be seen which side the GAO will favor, regardless of the outcome it is clear that after the dust settles the attorneys will probably close shop for two weeks and take their families to Bora Bora. Most of the documents have redactions, some more than others. One or two are virtually useless as a result, but most still contain a great deal of information. We will elaborate on them, but first, get a cup of coffee–it’s a long story.